To go along with my new beautiful halter, I had to get a matching lead rope. 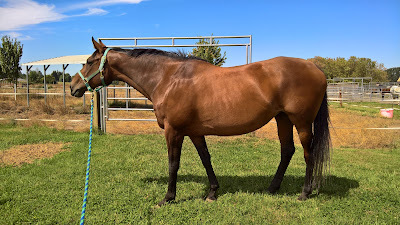 Luckily for me, Weaver Leather makes both halters and lead ropes, ensuring that I could get a color match (because as we all know, there are many, many shades of a single color). I ended up ordering the Weaver Leather Poly Lead Rope. The price was what drew me to both of my Weaver Leather products. I ended up getting my lead rope from $12.79 on Amazon. The prices on Amazon range from $10-20 depending on the color. That is about as cheap as I feel comfortable going on a lead rope. I don't want to spend a lot of money on something that is going to live outside and get dirty, but I also don't want a flimsy rope that will snap on me. Speaking of color, there are sooooo many color and pattern choices. On Amazon there are 38 different choices. This can be a bit overwhelming. I sat for about half an hour just comparing all of the different choices that I had, but this is also awesome because you really can get a lead rope that you enjoy. I was trying to match my lead rope to my turquoise halter and so ended up getting the blue/turquoise/green color (and yes I realize how terrible a description that is, but it is how Amazon labels them). 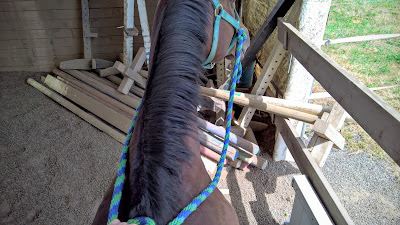 The colors are basically a spiraling stripe up the length of the rope and the turquoise in the lead rope does indeed match the turquoise as the halter (perfect for my little OCD heart). The lead rope is 5/8 inch by 10 feet. Those numbers meant nothing to me though, so my assessment of its dimensions are that: the rope is the right thickness (where is it easy to grab, but not so thick that it is hard to multiple loops of it) and it is really long. I don't know what I was thinking 10 feet would look like, but this lead rope is definitely longer than what I normally use. I can stand really far away from my horse and still be holding onto her. Personally, I think that the lead rope is a bit too long for me. I don't like having to make four loops of the rope just to lead my horse around. 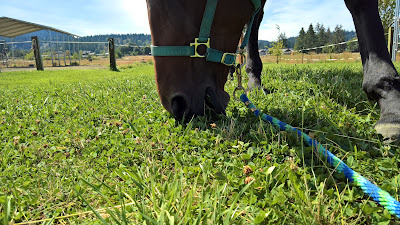 That being said, I know that most people prefer a lead rope to be longer rather than shorter, so maybe I'm just the weirdo who doesn't like a too-long lead rope. In terms of quality and strength, this lead rope is meeting my expectations. The clasp is a non-rust solid brass 225 snap (again, I have no idea what those numbers mean). The clasp seems sturdy and solid. I haven't had Casey spook on me since getting the lead rope, but once she does I'll give an update on how it held up to the challenge. The rope itself is advertised as having a soft and broken-in feel and I can attest to yes, this is true. I used to rock climb and so I am incredibly picky about my ropes. I absolutely despise stiff ropes (I find them really hard to work with), so having a nice soft rope is a must for me. The edges (as in the two ends) are heat-sealed. When I got my lead rope the end without the clasp was starting to unravel a bit. The three colors were independently heat-sealed and those seals were fine, but the three colors had not been sealed together properly. It was a little concerning to see that, but the great thing about a heat-seal is that if it starts to come apart you can just apply more heat for a better seal. I spent probably 30 seconds holding a lighter to the end and pressing the three colored mini-ropes together and voila, brand new heat-seal. Since I "fixed" it, I haven't had any further problems with the heat seal, and so far my lead rope is holding together very nicely!